Yammer is an enterprise social network which I have looked at in great detail in the past. Enterprise social networks have their work cut out, it is not easy getting workers to sign up and use a new social network especially when the primary function of it is work related. 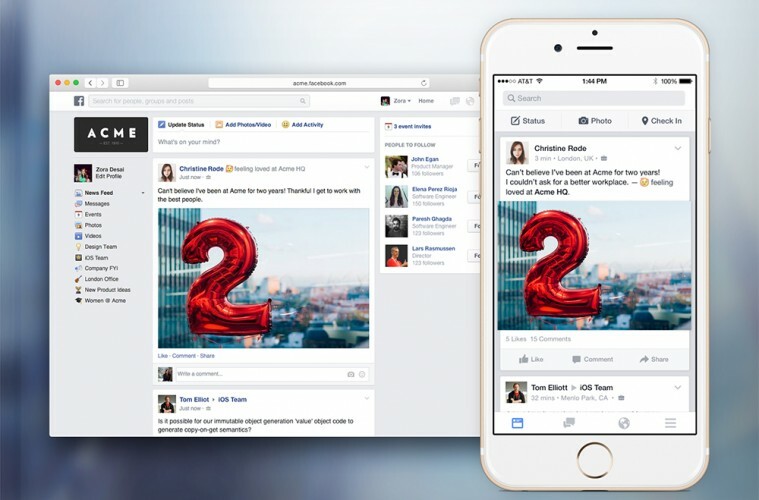 Earlier this year, Facebook took the wraps off their new platform; Facebook at Work. This is an enterprise version of the current social network which has been built for businesses and collaboration. After a few months of the pilot programme, Facebook has now announced their biggest customer yet: The Royal Bank Of Scotland. The Royal Bank Of Scotland plans to have 30,000 workers on its [email protected] platform by March next year and then the entire 100,000 members of its workforce by the end of 2016. The deal shows how ambitious Facebook is to get big businesses onboard and make the platform a success. Facebook says that there are now around 300 businesses using [email protected] and they include well known names such as Heineken who have their U.S. workforce trialling the product as well as 4,000 employees from real estate firm Century 21 who are also on the social network. Facebook is allowing businesses to sign up for free and there are plans to roll out a premium subscription which will give access to additional network features at a later stage. [email protected] was an idea originally conceived and used internally by Facebook employees. Simply put, it is Facebook but for your work life. Collaboration software is forecast to be worth over $8 billion in revenue by 2018, so if Facebook can make their new platform work then there is money to be made and a whole new area for them to expand and diversify in. [email protected] is a basic version of Facebook where you have a wall, notifications, messages and groups. Users can also make voice and video calls as well as share screens with each other. I am personally part of a network on Yammer and I keep a close eye on how it progresses, I don’t participate in the network because as many of you who have read my previous pieces on Yammer in the past will know that I feel Yammer got it wrong. However, while there is activity on there, the adoption rate company wide is stagnant. The layout and structure of [email protected] is the same as the current Facebook which will only help with appealing to the workforce. The only difference is that [email protected] has a grey banner and your personal Facebook has a blue banner at the top. However, because so many people use Facebook it means that there is no learning curve. So far it seems like Facebook is taking the right steps, should they continue to grow as they have set out to then it may be soon time for businesses to drop what they are currently using and jump back onboard the Facebook train.